Ready for a dose of US History? John Browning designed the .45 Automatic Colt Pistol cartridge in 1905 specifically for use in a semi-automatic pistol, namely another one of his popular inventions: the Colt M1911. Adoption of this firearm/ammo for the US Army during World War I is credited to another John; John T. Thompson. Thompson loved the .45 ACP and envisioned using it in an "Auto Rifle". Both the M1911 and the Thompson submachine gun were adopted by American troops by World War II, which makes the .45 ACP one of the most storied ammunition cartridges of the early 1900s in America. Federal Ammunition has been produced in Anoka, Minnesota since 1922. An American brand known for consistent quality, Federal has partnered with the US Army for most of its history. During World War II the Twin Cities Army Ammunition Plant was developed and Federal was the lead contractor operating the plant for the War Department. 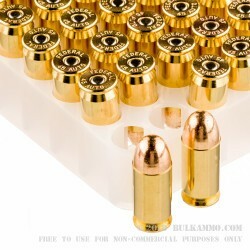 During that time, they produced .30, .50, and last, but not least, .45 ACP. That's certification that Federal American Eagle .45 ACP is a great choice for your next trip to the range! Great service. Won't go anywhere else. Excellent ammos, excellent service ! I usually shot "White box" back before the apocalypse, because it was always readily available at wal-m. Now, I strictly shoot this & strictly buy from here because of the same reasons. I use this brand/type ammo in both my Springfield armory mil-spec 1911 (.45acp) as well as my Beretta 92fs (9mm). I have NEVER had a single malfunction with either weapon. .P.S. I have shot approximately 1,500 rounds of AMERICAN Eagle, bought from here, through both of my above mentioned everywhere everyday carry guns & I never have any question or worry if it will work when I need it most. Great product, no problems, good price. 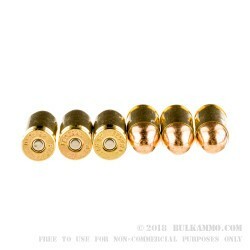 This is my second time buying 1,000 rounds Federal .45 from Bulk Ammo. And I will probably be back. Couldn't ask for an easier process. Took awhile to get here (west coast) so that is understandable. I've put about 1,400 rounds of this through my Sig Sauer P220 and haven't had a single problem. Would definitely recommend this product to a friend. Would recommend great ammo, excellent service. Q: What is the muzzle velocity? A: Hello Del, According to Federal, the muzzle velocity of this round is 890 fps. A: Hello Vladimir, This American Eagle ammunition is loaded with standard Boxer primers. Q: Is it made in the usa?